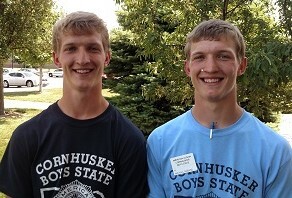 Twins Marshall and Michael Gibbens of Sargent, NE have many things in common! A new addition to that list is Cornhusker Boys’ State. That said, Michael holds bragging rights as his town, Belleau Wood, won the coveted Outstanding Town award. The duo were the 3rd and 4th Gibbens brother to attend the week long government simulation and leadership experience. Wednesday night, Nebraska Governor Pete Ricketts addressed the entirety of a rowdy and captive Boys’ and Girls’ State. He set the tone for the night with the quote “Just because you may not be interested in politics doesn’t mean politics won’t take an interest in you.” He addressed many different issues throughout his address and later on took questions for the audience. 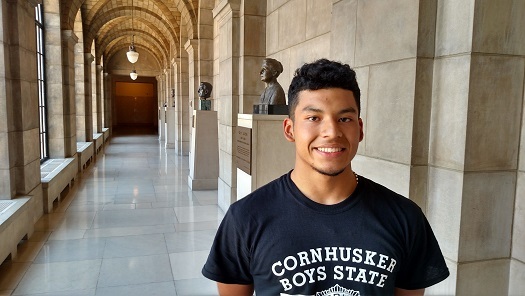 It was a great opportunity for both the boys and the girls alike as it provided a deeper look at the political system here in the Cornhusker State. When taking questions from the boys’ and girls’ staters, it became quite obvious why he was elected. To put it plainly, he knew what he was talking about. Whenever he answered a question he captured the attention of everyone there. His answers were so in-depth and interesting that the audience couldn’t help but pay attention. In some cases, questions were answered that weren’t even posed. The most notable thing about the night was that he very easily could have talked straight until 9, but he kept it short and simple as he wanted to know what the boys and girls in attendance had to think. One might say that is the “typical politician” approach, but it felt much more down-to-earth. Pete Ricketts felt like somebody you could sit down with and have a good, healthy conversation with, no matter the topic. It was truly and honor to hear the Governor talk first-hand. It was a fantastic experience for everybody at Boys’ and Girls’ state. We were all paying attention and listening to what he had to say, regardless if we consider ourselves politically active or not. Thank you so much to Governor Ricketts for taking the time out of his day to stop by Boys’ and Girls’ State. We hope to have further interactions in the future some day. The Boys’ State Legislature entered its second session with a brief prayer from Chaplin Meckel followed by hearing Governor James Moseman’s State of the State Address. He asserted that the foster care system needed an overhaul, and that young people are shying away from the political process among many other things, hoping to set the tone of the legislative session to come. He presented positive points such as low unemployment and high profits from commodities, but also mentioned negatives such as problems as the low retention rate of Nebraska colleges. Following the governor’s speech, the legislature divided into committees to discuss bills that had been presented; an estimated 96 bills have been given to the legislature so far. Representatives from the Pro Life PAC, the Agriculture PAC, and the Gun Bro’s (sic) discussed bills that they had given to members of the legislature to present. The Legislature moved to the long awaited General File phase of the legislative process. The first bill that was brought before the body was the Energy Deregulation Act calling for the allowing of private energy companies to provide services to parts of the state that were previously regulated by a public provider. This would’ve been done in hopes that the competition would drive prices down, but the bill was killed. The second bill was a bill outlawing the transportation of Marijuana from Colorado into Nebraska and established a fine for doing so. A couple amendments were added to the bill, but in the end it was killed. A third bill was one advocating for a commission to put those incarcerated for marijuana use to be given other options besides jail-time, in order to relieve prison overcrowding. This bill was passed. The last bill the legislature considered yesterday was one that gave those given life sentences the option to be killed instead. This was the Unicameral’s first day using Parliamentary Procedure, and it was a productive one. Several bills that made it out of committee were then presented to the general legislature for discussion. Once committees amended and approved their first, second, and third ­priority bills, they were discussed in order first of priority and second by committee number. Bills LB105, LB100, LB99, and LB25. Bills LB105, LB99, and LB25 were tabled; LB100 was filed to select. On the docket for the Thursday Meeting is LB10, LB69, LB40, and LB102. and humor clearly energized the delegates. Between the standing up, clapping, and talking to oneself, she conveyed many important messages for all of the leaders here at these two camps. These were the lessons of recognizing the importance of how you carry yourself in your daily activities, and how that affects your leadership. The audience followed Owens-Nauslar through comical and serious subjects, her achievements and failures, and therefore connected to them. What she said rang true and was relevant for all of the Staters. We must all “get up” (even to the obnoxious whistles of the counselors) every day, and have a positive outlook on what we are going to do here and the people we are going to interact here. We must all believe we are capable of making a change, and getting something out of what we put in at Boys’ State. And nothing like the round of applause and standing ovation for Dr. Joanne Owens-Nauslar shows that all of us agree.